If you are looking for some casual Android games that you can play without worrying much about the complicated missions and controls of the game, then you have come to the right place. In this article you will find some Android games that are simple and easy to play but yet delivers ultimate entertainment and challenge. So, read on to know about the games and how to play them. The following are some of the Android games that are simple looking but the fun you can have with playing each one of them is fantabulous. These games are not about completing complicated missions and scratching your head with no idea to go ahead. These games are meant to be played just for the sake of mind refreshment. There is only one goal in the game and just is to try to break your previous high score. But these games can get you addicted specially when you are competing with others. So, let's dive straight into the list of the games. No One Dies is a 2D Android game. The graphics of the game are really simple and the goal you have to achieve in this game is also pretty straightforward. But, the game levels are created in such a way that it will keep tempting you to play the game again and again and beat your best score. This game is focused on multitasking, i.e., there are multiple players in the game that you have to manage simultaneously. This game is developed by Rinzz Game and requires at least the 2.3 version of Android. It currently has a rating of 3.9 on Google Play. How to play? To get started you have to first of all select the level you want to play. There are several levels; some of which are Classic, Survive, Deadfall, Escape and more. Once you have selected a level, there are different options for that level like Normal, Nightmare, Hell and Inferno. Once you go into an option you can select the player that you want and start playing. Each level has a different aim to accomplish. When you start playing the game you will understand what you need to do. 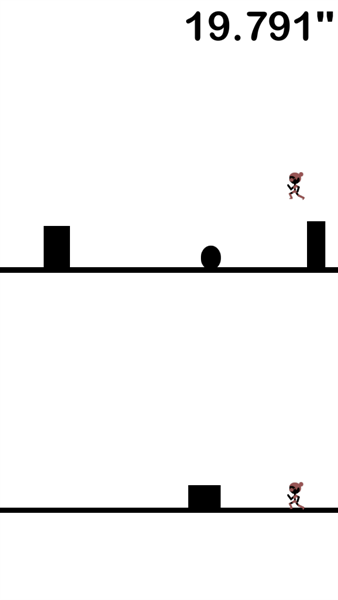 One of the levels of the game is that you have to manage two players by jumping with the player that faces obstacle. When you go to the higher levels, you will have to manage more than two player. 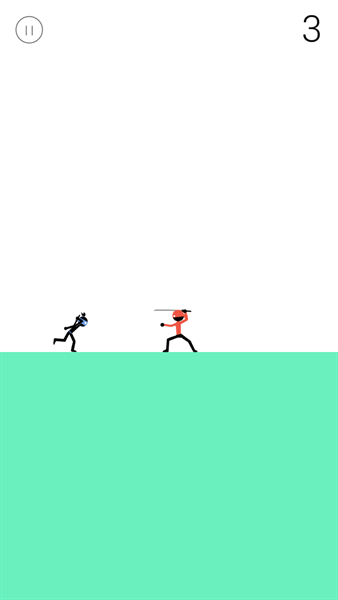 Amazing Ninja is a pretty simple game created by Ketchapp. It has just one level. It is actually of an Infinite Runner category. It is a 2D game with simple graphics but believe me, this game is really addictive. It is a free game and is rated currently 3.5 on Google Play by the community. It needs at least Android 2.3 or above. How to play? To play the game touch on the Play button and the game starts. The objective of the game is to destroy all your enemies (the red ninjas) but keep from accidentally hitting your friends (the blue ones). When you face an enemy you have to touch on the right side of the screen and when you see a friend you have to touch on the left side of the screen which will make your player jump over him. When you kill an enemy you get a point. By reading this you may say, 'Hey, this is pretty easy'. But once you reach a point, I bet you will accidentally kill one of your friends. Now this is a comparatively difficult game. As the name itself suggests you have to avert any train crisis (collision). 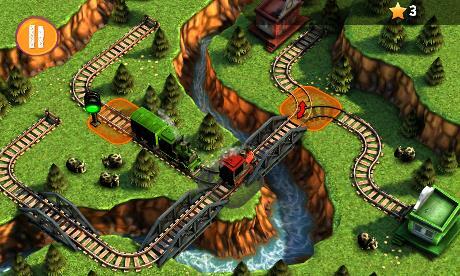 This is a 3D game with good graphics and animation offered by U-Play online. This game can run on Android versions 2.3.3 and above. This game costs Rs. 178. It currently has a rating of 4.4 on the Google Play Store. How to play? To play this game touch on the play button. Now you can see multiple trains coming out of different tunnels. What you have to do eventually is to guide each train to its corresponding tunnel (tunnel with the same color as the train). When you guide each train on its way, the difficult task is to keep your trains from colliding or derailing. You have the authority to display stop or go signals to the train. You also have the authority to change the direction of the track. But you have to do it with great precision and a lot of planning beforehand to achieve success in the higher levels of the game. You have to touch on the appropriate positions to perform each action. This game will definitely make you think a lot and probably improve your decision taking capabilities a whole lot. The next game that we have on our list is Wave Run. It is developed by SoftKiwi. This is also a simple game. This is a 2D game but has impressive graphics and animation. In this game there are two curvy paths. And you have a circle-shaped player. You can challenge your friends and get to the top of the leaderboard. This game needs Android version 4.0.3 and up. It currently has a rating of 3.6 on the Play Store. It is free to download. How to play? Touch the play button to get into the game. Once you start playing the only goal of the game is to move to the track where there is no obstacle. 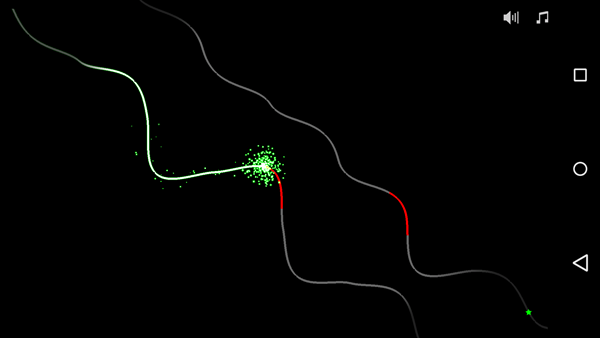 Each time you touch the screen the player moves to the other track. You have to do this at the correct time to avoid losing. This game is difficult to play when the speed is high. The camera moves in such a way that it becomes even more difficult and challenging to play. Pinna is a game basically of riding a unicycle. This is a 2.5D game. 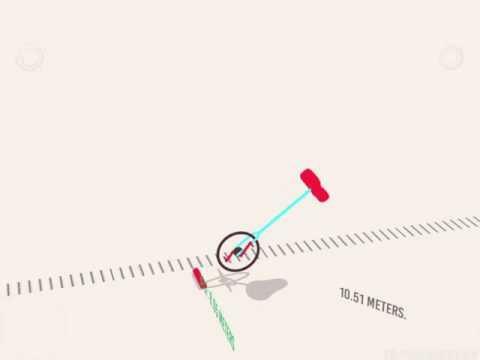 It has simple and impressive animations of when your unicycle falls. It might take some time to adapt to the cycling balance here. This free game has a rating of 4.1 on the Google playstore as for now. It requires Android version 2.3 and up. How to play? To play game you have to touch and hold the right side of the screen to cycle forwards and touch and hold the left side to cycle backwards. When you lean forward, your cycle moves forward. You have to keep a perfect balance to last longer in the game. The next game that we have on our list is One more lines. This game is developed by SMGStudios and it is free to download from the Android play store. It is a highly addictive game with excellent graphics though it is a 2D game. This game is free to download and has a rating of 4.0 on the Play Store. It requires at least the Android version 3.2. How to play? When you start playing the game you basically see your player going up with a trail behind it. Now, the only thing that you have to do is to touch on the screen when you have an obstacle right in the front of your player. As long as you touch and hold, the player moves in a circular motion with the radius of the distance from the obstacle. Now you have to touch and hold till the correct time to start going to the upward direction. The games in this list are not high end graphical 3D games. These games are for those who have a little time to refresh themselves and get back to work again. The best thing that I love about these games is that they have easy controls. You don't have to keep a lot of things in mind about how to run the game. All you have to do is to think of the best strategy to achieve the goal. These games can make you think strategically and thus might help in real life as well. So, what are you waiting for? Go ahead and download these games (don't bother; they are not that huge in size) and enjoy every moment of your life. Good collection indeed! Those games reminded me of the good old days where we used to play the Snake game on our Nokia phones! That was a big treasure for us back then. Now, the technology has improved, and improved for good - but do we have same level of satisfaction? The current range of games do not need you to plan anything strategically. You just go on using technology and the infamous power ups and in-app purchases to win a game. Thanks for helping out with those retro styled games.